The visual changes are minor however now when you click the “Upload Form” button it will use a new XLS Form uploader (see next section). We no longer use the ODK pyxform loader. Just in case this causes problems there is a link, under the upload button, back to the original page that still uses pyxform. One reason you may want to use the old page is if you have to upload in XML file which the new upload function does not currently support. There are 3 new columns in the forms list. Groups become really useful when you use tasks to progressively complete a survey. So form one fills in some of the data then a user is assigned an instance of form 2 to get the rest of the data. This instance can include the data collected by the first form. 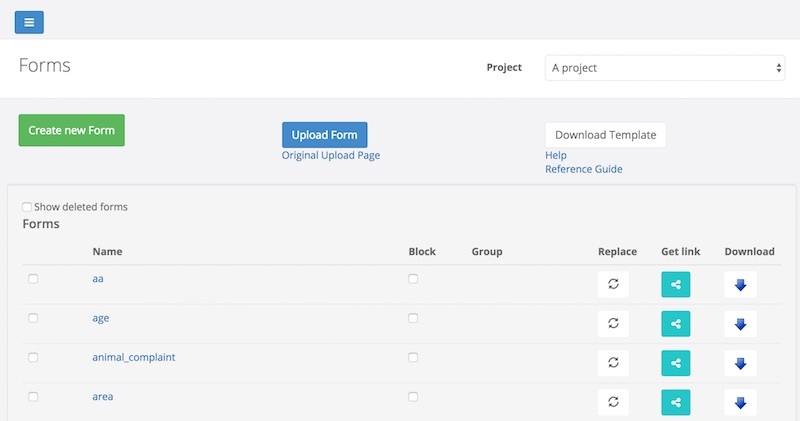 You can also set a key policy of “merge” on surveys in a group so that records are updated rather than replaced. This could allow you to create a records management system. Yes you can now replace a form with another uploaded from an XLSForm template. You can do this even after you have started collecting data. If the form you are uploading does not have questions that were in the original form then any data collected for those questions will be hidden but not deleted. Click the replace button next to the form to be replaced, specify the new template and click upload. The only thing you should avoid changing is the “type” of a question. This is only a problem if you have already collected data for the old type in which case future submissions will fail. So if you need to change type, say from integer to text, then create a new question with a different name and delete the old question. Alternatively if you are in a position to delete already collected data, perhaps it was test data, then you can do that before collecting new data. Click on this button to get a link to complete a webform that does not require a password. You can copy this link and email it to someone who does not have an account on Smap and they can then fill in the web form. If a form has a public link then the link button will be a darker shade of blue. When you no longer want people without accounts to complete webforms then you should delete the links. Previously if you had referred to a single choice list from multiple questions then after you uploaded that data this sharing of choices would all be lost. If you then made changes to the form in the online editor and downloaded the resultant XLSForm you would have a mass of duplicate choices. This no longer happens and you will get your original choice lists back. max-pixels=500 Set the maximum number of pixels on the longest edge of a photo to 500. The photo will be scaled accordingly. This can be used to reduce the size of images. And many others. Check the Survey Edit Reference on the google help drive for a complete list. Roles you specify for a form will be created if they do not already exist. If you add a role but do not specify columns or row filters then a person must have that role in order to be able to see the new form. To add roles with column filters add a column role::”role name” in the survey work sheet. Specify any questions that should be visible to that role by putting “yes” in that role column for that question. To add a role with a row filter add a column role::”role name” in the settings work sheet. Specify the row filter underneath the role. Issue 188. Times in PDF exports are now set to local time. The latest version of fieldTask is now included in the release so it can be downloaded from the web server rather than google play store. The website will attempt to check if your Android version is greater than 4.0 and if so it will get the new fieldTask. Otherwise it will get the old one. Added a user security group of “view_data”. People with this role will be able to view aggregated results like an analyst but will not be able to delete data or create new forms. This entry was posted in Uncategorized on February 16, 2018 by Neil Penman. There are many more features in version 17.12 than are documented here. Other release notes will follow. Yes! 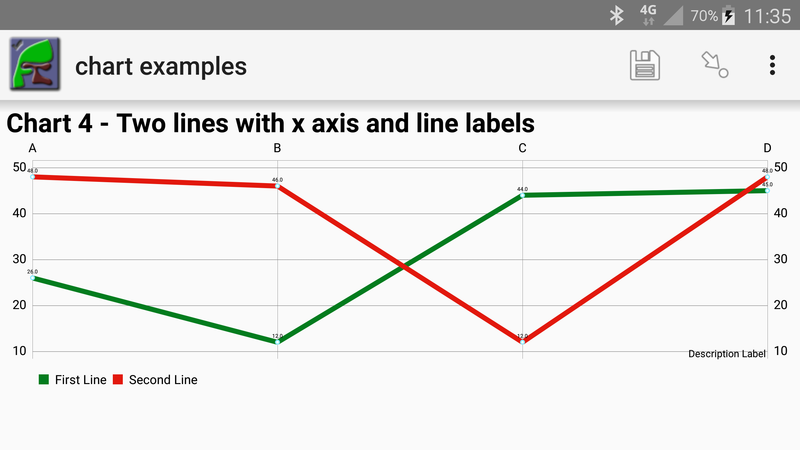 you can show charts inside the form on your tablet or phone. You will need fieldTask version 5.23 as well as Smap Server 17.12 in order to use these. This work was sponsored by InformEd International. 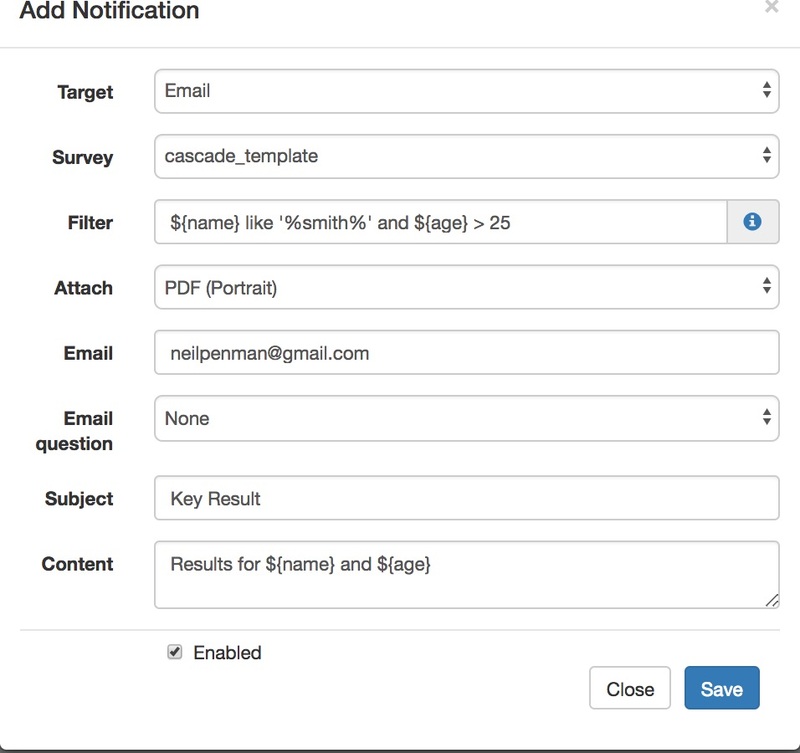 Using the pulldata() function you can get data from previously submitted forms. We have now added a new pulldata() type that will retrieve data as a time series. Hence if you are collecting data over time and you want to see a chart of that time series you would use this new function. The ‘chart_’ in the file name field tells the server to return data as a time series suitable for charting. A detailed example form with comments can be found here. This entry was posted in Uncategorized on January 11, 2018 by Neil Penman. Can now set default value for questions in the online editor. Added option to do a full survey export without including its media. Some surveys can have many gigabytes of images and other media submitted. Just on the off change that you want to export the data and import it into a different survey but don’t need the images then you now have that option. Set a new notification to “enabled” by default. When creating a notification you can now specify a filter so that this notification is only sent when data is received that matched the filter. 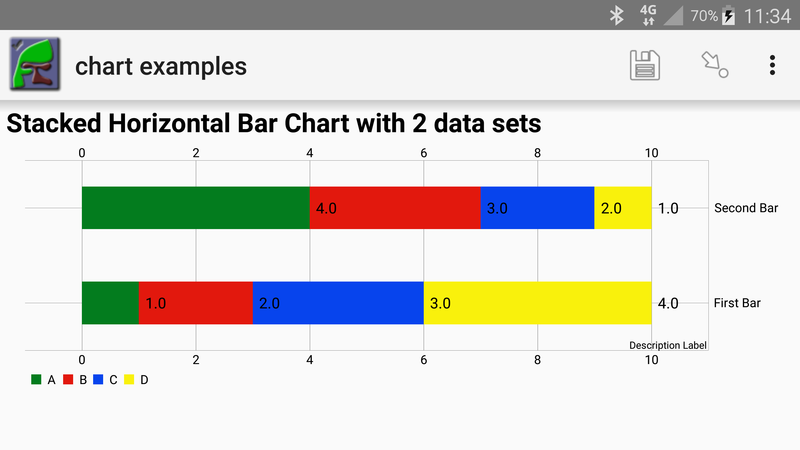 You can also use the same sorts of filter when exporting data from the analysis module. Actually the main improvement is that this now works again! The old approach relied on fieldTask notifying the server of the forms that the user had after they had done a “refresh”. However this did not reflect changes when the user had downloaded a form using the ODK menus and without doing a fieldTask refresh. Anyway recent releases of fieldTask no longer sent this notification. The updated form download monitoring now records all form downloads whether as a refresh or when the form is selected explicitly. One limitation of this new approach is that the device that did the download won’t be identified unless you are using version 5.14 of fieldTask. This entry was posted in Uncategorized on November 20, 2017 by Neil Penman. Its official! 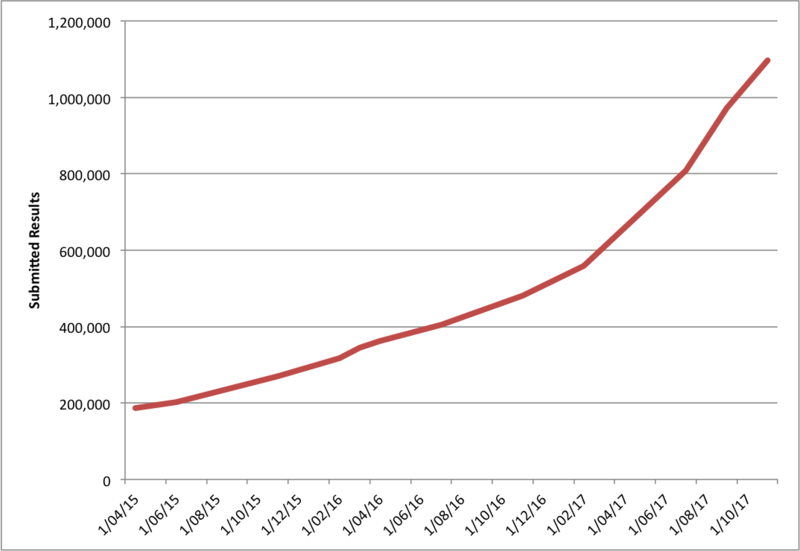 the number of results submitted to servers managed by Smap has gone past 1 million. It is fantastic to think that this tool has been useful to people and I hope it continues to be useful and to grow in usage. Thankyou to everyone using Smap and everyone who has contributed over the years to making it all possible. This entry was posted in Uncategorized on November 13, 2017 by Neil Penman. Two releases in one month! Issue #125. Hyperlinks in PDF templates are all put on page 1. The new features listed above are described in more detail below. 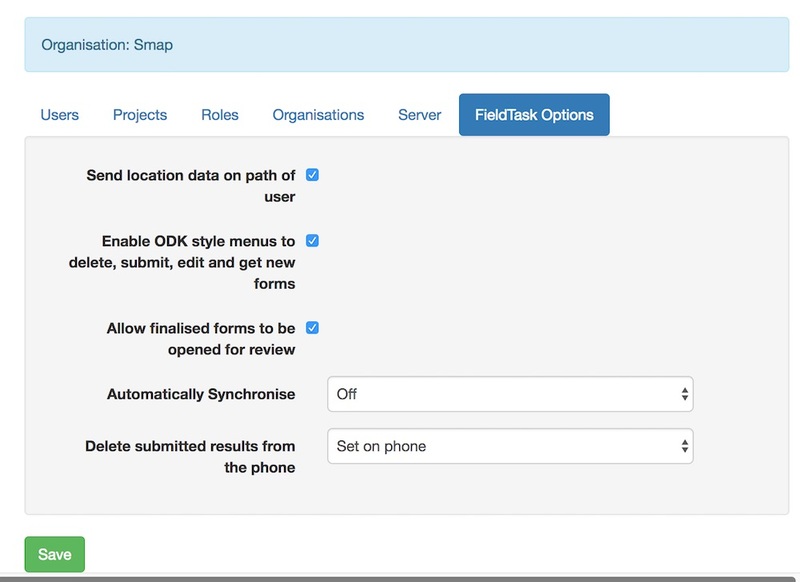 Firstly you no longer require organisational administrator privileges to set set fieldTask settings on the server. Because of that they have been given their own tab in the user management page next to users and projects. So now any administrator can specify the fieldTask settings but these changes still affect all phones that synchronise with the server. Secondly, where there is a corresponding setting that you can specify on the phone then these will be overridden in a more consistent way. This affects automatic synchronisation and the automatic deletion of instances from the phones after they are submitted. For each of these you can now specify a value of “Set on phone”. The phone user will then be able to configure these as they wish. Any other value will override the setting on the phone which will be disabled so the user cannot change it. Off. The phone will not automatically synchronise. Wifi. The phone will synchronise only over a wifi connection. Wifi and Cell. The phone will synchronise over a cellular and wifi connection. Off. Results are not deleted. Previously you could create tasks from survey results and you could select which tasks to create by specifying a value for one question in that existing survey. You can now do more sophisticated selection of tasks using the same approach that was added to notifications. 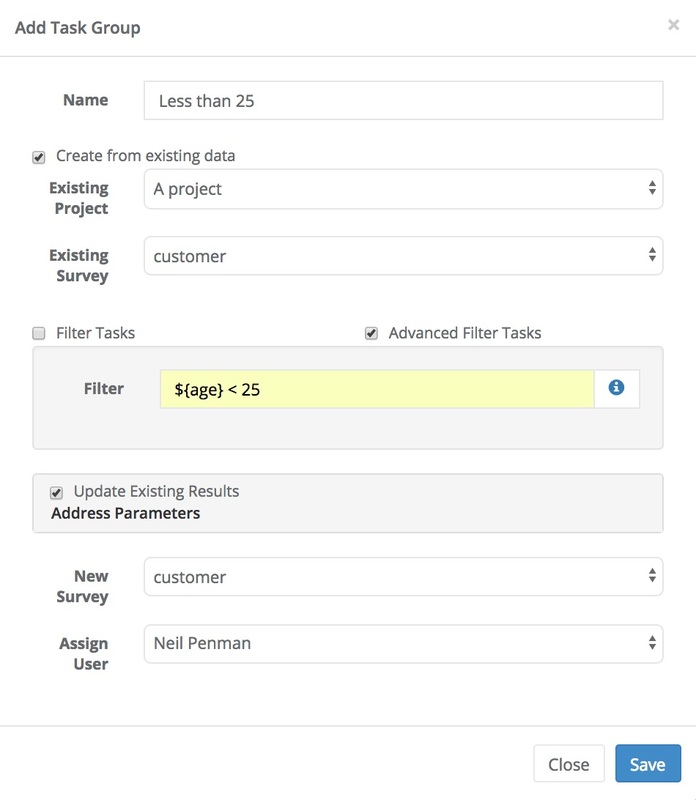 When creating a task group from existing results select the “Advanced Filter” option. You can then specify the filter you need. For example in the following dialog I am organising a follow up survey for all results where the age was less than 25. If you have uploaded a PDF template for a form using the settings dialog then you can now download that template, also from the settings dialog. To do this select the downward chevron next to the template name. This entry was posted in Uncategorized on November 5, 2017 by Neil Penman. When you add a notification, such as an email alert or forwarding of data to another server, you can now specify a filter so that only matching results generate the notification. In the above example a PDF of the results will be emailed if the name contains the characters “smith” somewhere and the age is greater than 25. You can get more details on the syntax of these filters by clicking on the (i) icon to the right. Note that the name and the age has also been included in the body of the email along with the PDF for the results. You can embed any question answer in either the subject or the content of the email. Artificial Intelligence has now been build into Smap! In the parameters of an oversight form you can now add “auto=yes” to questions that refer to an image. That image will then be processed by Amazon Recognition to identify objects automatically. For an example of how to process an image in an oversight form refer to this article. In the monitor there is a separate column for “Upload Errors”. This just shows the number of errors that have been seen on phones or webforms when users attempted to upload results probably to a deleted or blocked survey. Usually the administrator will fix the problem and then the user tries again and this time the data is sent. You don’t need to worry about this number just make sure that all results end up being sent from all the phones successfully. Previously if you renamed a form part way through data collection you would see two rows of upload counts. One for surveys uploaded to the old name and one for the new. Now only the latest form name is shown along with the total of uploads for that form. This entry was posted in Uncategorized on October 27, 2017 by Neil Penman. In this release we have improved support for translating answers to questions from one language to another. For example from French to English. You can use the same feature to facilitate transcribing to text from an audio recording or a video. For example if you have an audio question called q2 and you want to write the translation into a column called audio_transcription, then you can write your oversight form as shown below. The parameter source=q2 has been added to the audio_transcription column. Clicking on a record in managed forms then shows a page similar to the one below where the user can play the audio and write the translation. a text question in order to convert from one language to another. and a video question in order to add commentary and a transcription. rows=a number. This sets the number of rows to show when entering data for a text column. In the above example the number of rows were set to 3. However you can click on the bottom right-hand corner of the text box to make it smaller or larger at any time. form_data=off or form_data=on. This is applied to a new row type called settings. When set to off the form data for the selected record is not displayed which is useful when you are focussed on referencing specific questions. A new result type of “Upload Errors” has been added. The background to this is that previously a change was made to the monitor to show errors that occur when the results of a survey are submitted and are reported back to the phone or webform. Commonly these are due to a survey being blocked or deleted. However these errors are generally fixed directly by the users. For example they will see an error on their phone because the survey is blocked. The survey will then be unblocked and the user will re-submit. All is good. However the monitor page will then show 1 succesfull upload and 1 error. It is still useful to see if there have been any errors in uploading results. The new type of “Upload Errors” shows these. These errors are just informational and should align with errors reported on the phone. The “Errors” column will continue to show uploads that were accepted by the server but then for some reason failed to get applied to the database. These are the sort of errors where you might say “where is my data?” and are more significant. The second change made to the monitor page is to always show the latest name of a survey. Previously if you submitted 10 results to a survey then changed its name then submitted 10 more you would see two rows for the two survey names with 10 uploads each. Now you will see one row and it will be for the latest survey name and have 20 uploads. 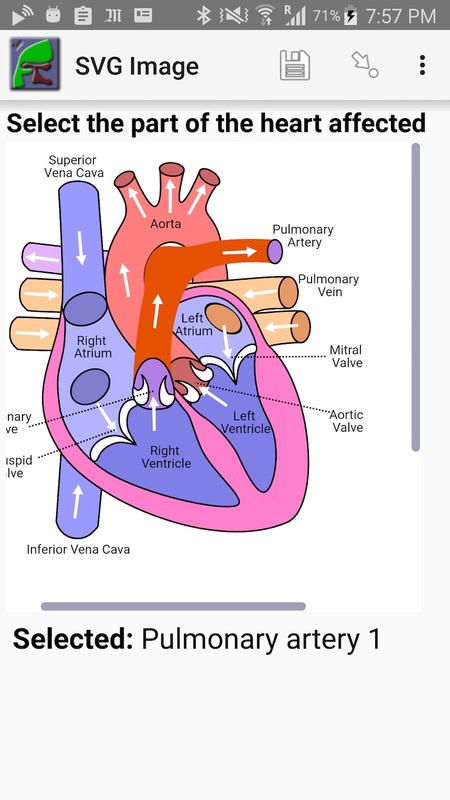 Add hyper links to video and audio answers when generating PDFs of submitted data. Added “nochoose” to video and audio questions. Previously this only worked for image questions. If set then when completing a form with image, audio or video questions the user will not be prompted to add media from the phones sdcard. This entry was posted in Uncategorized on October 3, 2017 by Neil Penman. Questions that ask the user to select from a range of values using a slider have been included in odkCollect and are now also available in fieldTask. Support for these question types has just been added to Smap Server version 17.08.03 which will be deployed onto hosted servers next Saturday or earlier. Add a range question to your survey using the online editor. You then have to specify 3 parameters in the parameters property. If you add a decimal point to any of your parameters then the collected data will also be decimal. Otherwise it will be integer. The Survey Edit Reference document has been updated to include range. Range questions are not supported in the xlsForm editor yet. This entry was posted in Uncategorized on September 25, 2017 by Neil Penman.